There are arguments against running a Turkey Trot on t-day, not least being paying $30 to a company that organizes races all year round, so that I feel my money is going to them rather than the non-profit they are supposedly donating to. But they are, and here in Boulder, where I am visiting, it's to a non-religious organization that feeds the hungry without any proselytizing, and people are bringing cans of food to donate too, so that's ok. 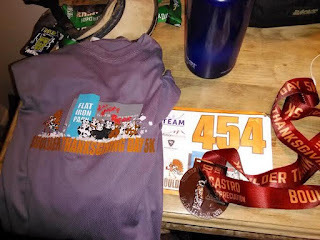 The actual organization of this particular race is a little disorganized: I've run Turkey Trots run by volunteers that are done better. Not to mention that with a full free day, most 'serious' runners might rather run a longer distance on their own, with the streets mostly quiet and car-less, which I would have been tempted to do, if alone, but I'm not, I'm with friends and that counts for a lot. Plus we've biked to the race—it's Boulder, with bike trails everywhere—and will bike home, so we'll get a little extra calorie burning before the later feasting. It is a wee bit cool this morning. Supposed to have gotten to 48 by the start of the race, but that's not happening so far. The sky is slightly overcast, which at this altitude can change the temp ten degrees. I have some layers on, and a wool watch cap, and I've pedaled over in my moccasins, but take them off as the start approaches, and the cold pavement is, well, cold. If I could just get running I'd be ok, but it's the waiting around. Shoulda/coulda worn some throw-away socks, which I've done before, but I keep thinking, it's just a 5K, any suffering won't last long. We are running on pavement, on road, starting right outside the race company's building. Yes, they have a building. And four vehicles. But they couldn't get a permit in time to go on a path on a green belt, so we're doing a little loop around an industrial 'park' area of side streets. Perfectly fine, though we have to do the loop twice which, when the organizer explains it in his australian accent, just sounds confusing, but apparently there are some Serious Runners here who will do this fast, since this is a qualifier for the famous Bolder Boulder 10K in the summer. First I've ever heard you need to qualify for a 10K, but I guess it's huge and you can get placed into time sections. Anyways, we have make sure to run on the right side (or left? or something...) so that when the sprinters come through we don't get in their way on the loop. Whatever, I'm just here to chew bubblegum and run barefoot, and I'm all out of bubblegum. I'm getting some looks from folks as we wait to start. No other barefooters, which in Boulder I'd have thought there might be. Not even really any minimalists, except some zero-drop Merrill's here and there. Oh people, those thick soles will hurt you in the long wrong. But who am I, just some strange barefoot dude. We're off! Over the time pad. I remember when the time chips used to be these big clunky things you tied onto your shoes. Now they're slim strips of metal on the bibs. Easy peasy. One friend and I positioned ourselves 2/3s of the way up, so as to avoid all the slow people, but the downside of that is that I'm with fast runners, so have to run fast, and immediately, though the mob thins out quickly, people are passing me, which is bad for morale. Mine, that is. Ah well. But now I'm hearing some comments: "Wow, no shoes!" and "Oh my god!" Not to me, just talking behind my back. But that's fine. A woman and her daughter, like 12, seem to be running about my pace, and I hear the mom point me out. She comes up next to me at a curve. "We really admire you for running barefoot!" Oy. Well, be gracious. "Thank you." "You must have tough feet." I want to say, well, we all have tough feet, and you could do this too, but I'm kind of sucking air, and don't want to be some mansplainer, so I just smile and shrug and say, "Eh." I hope that isn't taken as rude. Probably is, now that I think of it. I'm a horrible barefoot ambassador. I've left one friend behind, but another passes me speedily. We exchange ça va? 's and she's off. I'm just in a steady stream of people passing me. Merde. But, the feets are good. Warming up a little, though I felt, at first, that I was really running 'clunky', really slamming my heels down. Not sure if that's an illusion or just because of the cold, but gradually I'm feeling more normal. A more than normal pace, of course, which is the advantage of running a 5K, versus running on your own for longer: a good sprint practice. We come to a sharp right turn around some cones, then another turn and a long straight-away back to the start, where we can see the Serious Runners already coming back on the second loop, some of them in a full-on sprint. And then I too am making a sharp right around a cone and into loop two. Et voila, le soleil, the sun comes out and warms everything and everyone. Now a perfect running day, though may not last. We come into the last straight-away, but do a hairpin turn for the second loop. A guy comes at from the side, almost as if he wasn't quite running in the race? Not sure? He's older. Or, older than I. "How's that barefoot running going?" Uh oh, he sounds like he's getting ready to run the rest of the race with me. "Um, going fine!" "Do you run with ____'s group?" So apparently there's a Boulder barefoot running group? Cool. "Um nope. I'm from out of town." "Do you know Barefoot Ted?" Whoah, random. I didn't even tell him I'm from the northwest. "Um, I've met him." "How long have you been running barefoot?" I have to think. "Um...since 2009?" "No s**t? Wow that's amazing. You know, that's when barefoot running was really a fad. There's was this book that came out that year, really made it a fad. Barefoot Ted was featured in it." He is of course referring to Born To Run, which everyone always thinks of as the barefoot running book, though it's not. It just has Barefoot Ted as one of the featured runners, but is really about long-distance running. As anyone reading this will know. Or, I guess not. But somehow people who see me in races seem to think I'll have never heard of it. I don't know, I just want to run alone, dude. I don't need your passive-aggressive "fad". So I say, "Have a good race!" He gets the clue and goes off to talk to someone else. Then I get passed by a big group of folks, I'm not sure if they all know each other, seems like some kind of pace group? But for a 5K? I don't know, but man, I've just been passed the whole race, though I don't feel I've really slowed down that much. Well, maybe a little. Still sucking air, feeling that altitude, and the coldness of it too. I'll be coughing all day. And then we're in the final straight-away, for the second final time, though looks like some of the Serious Runners are even going around for a third lap? Why not? I try for my usual last-minute sprint, which works a little, and I pass maybe one person. The thing with 5Ks is that everyone else still has a reserve too. Sprinting barefoot on pavement, this will actually be the most sandpapery part of the race. But! I cross! 28:13. Shaved off almost two minutes from my Monster Dash 5K of a month ago, though slower than my glory days of, like, five years ago. About halfway among total finishers and halfway in my men's age category. Can't complain. A fun morning. Time to find my friends and go on to eating lots of food. Thank you for being a part of the event. I just wanted you to know that even though we used the Bolder Boulder parking lot, they did not put on the event, I did. The offices are certainly Bolder Boulder's, and not mine. We just used the space for number pick up etc.. The only permit we did not have was the alcohol permit. We had all road permits and we are NOT allowed to use bike path or trails here in Boulder, so hence why we were confined to the Flatiron Park industrial area. The event donated 664 Lbs of food and it will also donate roughly $3,000 to the Harvest of Hope Food pantry. We have not had a Thanksgiving Day event in Boulder for 3 years, so we were delighted to finally get the City of Boulder's approval to stage an event. We have already started working with the City to hopefully have 1 big 5K loop and not 2 x 2.5K. I know a looped course like this is not ideal, but for our first year, that is all the City would give us. The event had numerous volunteers on the day but we were around 10 volunteers short for what we needed, but I was happy with how hard they all worked to make the event as safe as possible. Thank you for being a part of this event and I hope you had a great Thanksgiving Day. I hope we see you next year with a lot more things to be added, that I am sure you will enjoy.